When flexibility & speed meet reliability & performance for entry into an entirely new product segment. FAIRFIELD, N.J. – KYOCERA Document Solutions America, Inc., one of the world’s leading document solutions companies, previewed the TASKalfa Pro 15000c, in an exclusive exhibit at the 2018 KYOCERA Innovate dealer conference in Orlando, Florida. The TASKalfa Pro 15000c represents Kyocera’s inaugural product entry into the high-speed cut sheet inkjet market. With print speeds at 150 pages per minute in A4 (146 pages per minute Letter), regardless of media type, this full-color production inkjet printing system delivers unparalleled quality and reliability. Ideally suited for Print Service Providers and customers looking to run medium to large volume jobs in-house, the TASKalfa Pro 15000c delivers the necessary functionality at an attractive price point. “The TASKalfa Pro 15000c enables Kyocera, and its resellers, greater access to a broader customer audience, specifically in the production print market,” said Yukio Ikeda, President and CEO, KYOCERA Document Solutions America. The TASKalfa Pro 15000c will offer impressive media support and professional paper handling options to handle everything from high-volume variable data printing requirements to shorter runs of custom output. 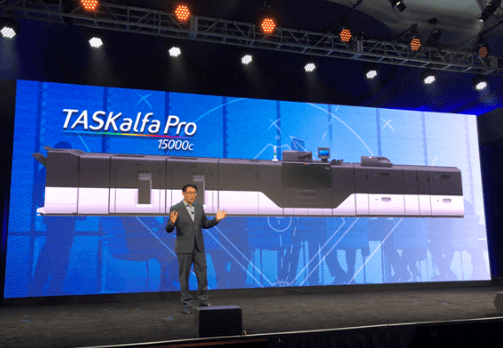 Slated to launch globally in early 2019, the TASKalfa Pro 15000c will be available through select authorized resellers both in the US and on a global scale. The TASKalfa Pro 15000c will be commercially available in early calendar year 2019. Detailed product specifications, and device MSRP will be made available at that time.